work: after the better part of a month, i've finally completed the long-overdue cleanout and re-design of my home workspace. 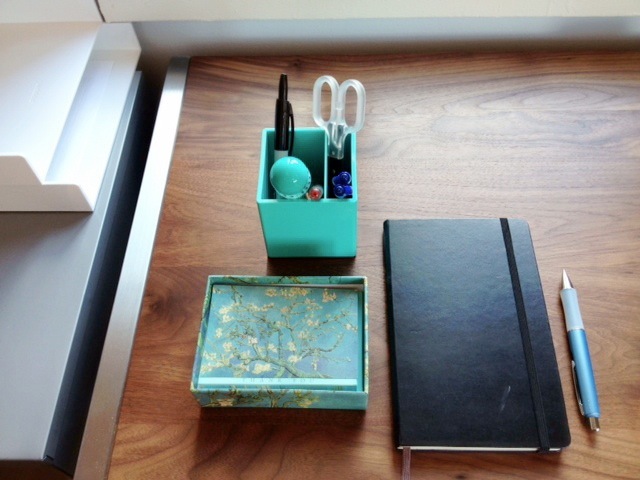 a minimalist planner, a stylishly simple pen cube and stacking in/out trays have made all the (inexpensive) difference. watch: thoughts after just finishing the first season run of House of Cards: i've really missed Robin Wright's steely acting since Forrest Gump. Kevin Spacey still plays the best villains. most importantly, i'm glad my Netflix subscription isn't a complete waste of money at this point. "I'm looking for a nice basic piece of clothing that can fulfill every need I have." eat: this Ina Garten recipe for provencal fish stew is one of my absolute favorites, and much easier than it looks (you spend the most time doing the prep). i can't resist a tomato-and-fennel-based dish that tastes even better the next day. also, on the recommendations of many readers from my post last month, i finally got Marcella Hazan's essentials cookbook. can't wait to start cooking my way through it! what about you? what have you been inspired by lately? Great inspiration - I really need to get around to reading the new yorker, although living in NZ it isn't quite so accessible here. And um.. I might be trying that recipe too, it sounds delicious. Lately, feeling pretty inspired by the recent APC collection, while I've been busy getting rid of most of the colour in my wardrobe, it makes me want to fill it back up with cool blue colours. I've also started reading a vegan food blog which has been inspiring me to try and eat cleaner food (nothing processed!) - never a bad thing in my opinion! the new yorker website is good for articles, they don't have an obnoxious paywall...yet. i haven't seen the latest APC, though good weather this weekend might get me out to the shops! Enjoy the Marcella Hazan cookbook! I am inspired by work at the moment, as well as the prospect of taking a vacation this weekend and catching up with a close friend. Your workspace looks so spare and inviting - I try to keep my desk clean, but my drawers are due for a clear-out I think. i'm trying to keep my workdesk as spare as possible. a clean and minimal space does wonders for my productivity! A chat sounds good - maybe once I am back next week from (gorgeous) Nepal? Hope you are doing well! And like Jamie, I've been liking all the cool blue/green shades which I've seen going around be it from APC to Toast (more UK based). Lovely. the recipe is fail-safe. it's so good! i usually don't like greens, but i love a celadon / sea-glass green this spring. I am inspired by people who manage to keep it altogether. Obviously I am still stressed out haha. Thanks for your offer to look out for the SA bag by the way, I am sorry I didn't reply to your email, I am WAY behind on getting back to personal emails.. I've always wished I was a better cook or at least a less lazy one! ha! amen to that. just email me back when things are less crazed. let's catch up on chat soon! haha there is more original netflix content to come soon too! you work space is wonderful. i have a lot of backed up issues of new yorker i haven't got a chance to read yet. i feel guilty. best mainstream magazine out there though. Yes to The New Yorker. I really enjoyed David Remnick's piece on the Bolshoi. that's so wonderful that you find the time to mentor young people. would love to hear more about it sometime over coffee or on your blog! what veggies are you growing? Lovely post - I like the look of that fish stew. I'm inspired by my boyfriend's undercut, camping and chunky cotton jumpers with skirts.